As a track sprinter on the velodrome, I am used to going 100% and doing everything I can to turn myself inside out. My typical efforts in training are between 20 and 40 seconds long and by the time I am done I often have a headache and a sudden urge to throw up. Pushing this hard did not come natural. To be able to push to this extent, it takes years of training and experience, and as the saying goes, "The stronger you get the more it hurts." So needless to say, I am a glutton for punishment… Maybe that's why I jumped on the opportunity to be a part of Race Across America 2017! In the beginning of 2017, my brother James approached me to see if I'd be interested in joining the Oceanside Police Department team for Race Across America. Of course there was some slight hesitation, being a sprinter on the velodrome, but this is a once-in-a-lifetime opportunity that I knew I needed to jump on. Since my training is typically done for races that are less than two minutes long, I needed to understand the strategy and how I would tweak my training to fit. Fortunately for me, I would be riding on an eight man team that is separated into two teams of four riders and put on a rotation. Only one rider rides at a time with the teams of four being on eight hour shift's. During your eight hour shift the four riders rotate who is on the bike every 15 minutes. Although compared to my typical racing, 15 minutes is a very long period, I knew that if done right I would be able to do what is needed to be successful. 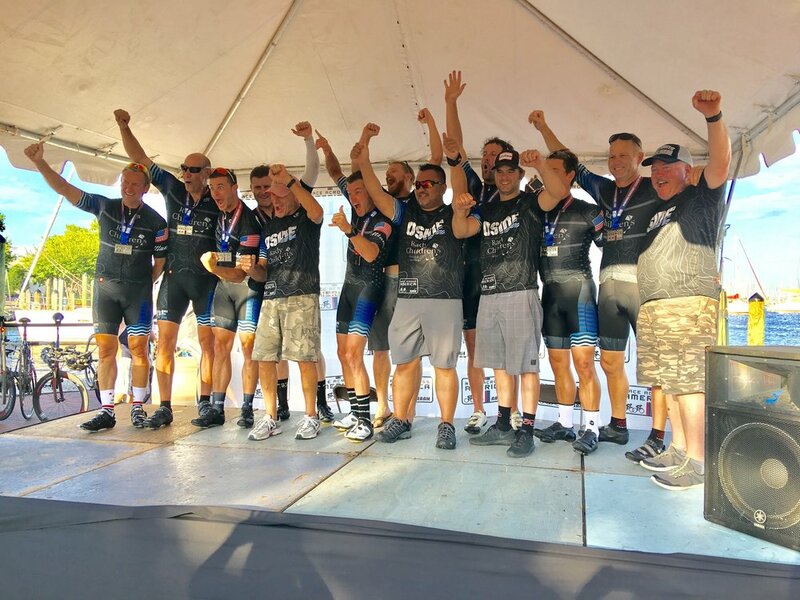 The total race distance is just over 3000 miles and the first team to the finish line wins. This means there is a rider on the road 24 hours a day until we reach the finish line. Being on an eight hour shift is nice because you get some rest, but really when all is said and done it only equals about 3 to 4 hours of sleep a day... Sometimes you may start your shift at 2 AM and then finish at 10 AM. That means you have to try to find some sleep in the middle of the day while being transported to the next starting location. Basically it is a sleep and logistical nightmare! On June 17th, we rolled out of Oceanside California in pursuit of Annapolis Maryland. My team of four was on second rotation so we did the initial parade ride for the first few miles and then hopped in the van for a few hours to our starting point. I knew going into this that the riding would be difficult, but the most difficult portions would be the sleep and keeping my legs as fresh as possible. Fortunately for me, I had my new RP Lite system! I had the opportunity to ride in almost every condition imaginable. The first few days through the deserts we did climbing at temperatures above 115° and had tailwinds at night that pushed me to 60 mph. During the rotational period of riding, it is a very strange rhythm. On the bike at 100% effort for 15 minutes until you exchange with the next rider and then get back into the van for 45 minutes. Sometimes in the van it is daytime and everybody is up and talking, and other times it is in the middle of the night and as soon as you get back into the van you fall straight to sleep for the next 45 minutes until it is your turn to race again. It took me a few days to find my rhythm. 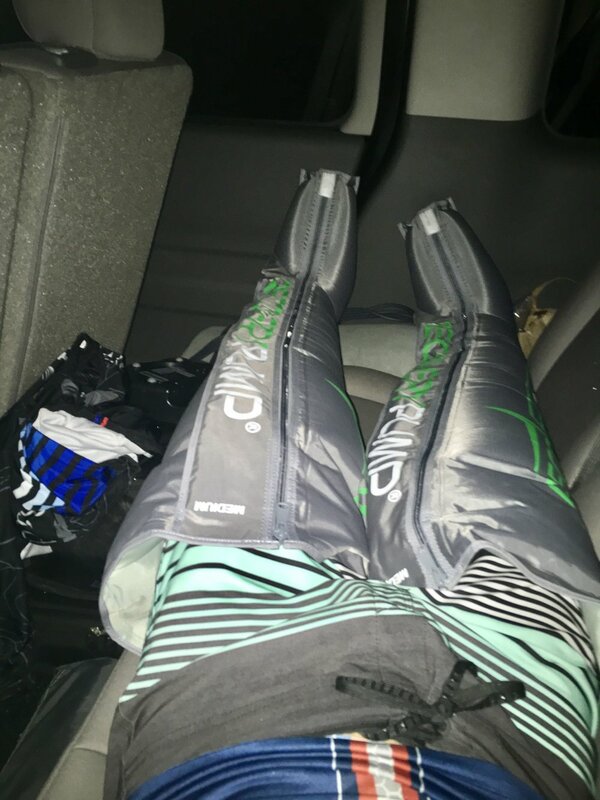 While driving ahead to our next starting destinations I made sure to have my Recovery Pump boots on for at least an hour to freshen up my legs. Having a whole row to myself in the SUV made this a very comfortable experience. I think at one point I fell asleep with them on for over two hours! Come day four everything starts to go numb. The way you would be able to hurt your legs the first few days became more of a doll ache. Once we got over the Rockies it was Time for some flat fast speeds! We ripped through the farmlands of America passing silos and tractors by the dozens. At this point I had figured out somewhat of a sleeping routine and could feel my energy and power on the bike climbing. Fortunately the temperatures had subsided a bit and the weather was nice. Although majority of the winds were at our back, there were a few instances that proved different. At one point, I was going all out as hard as I could in my aero position, and for my 15 minute interval my average speed was 16 mph… I've never experienced a head wind that literally felt like somebody was pushing me backwards. At times like these it was nice to be able to rely on teammates. When you get on the bike knowing that you're only there for 15 minutes it is easy to turn yourself inside out time after time. I can't even imagine the mindset that the solo riders have to complete this on their own. As we came towards the end of the race, I became that much more reliant on getting in my Recovery Pump boots after each rotation. It always was amazing how the first few squeeze cycles almost felt painful because of how tight and fatigued my legs were. Then five minutes through I wish I was able to get even more pressure because it felt so good. Nothing like having the feeling of an hour massage while sitting in an SUV driving up the road. Along with my Recovery Pump boots I made sure to bring my foam roller. I have noticed that being able to incorporate back flexion is a huge advantage since I am constantly in a back extension position. Like with any good road trip, the closer you get to your destination the longer time seems to take. Going into our last day seemed like eternity. Starting off at 4am in pouring rain was an experience like I have never had. It was our last rotation and I was sure to turn myself inside out to make it my very best. Although we were not in the mountains, the terrain was extremely undulating. Quick steep short climbs with fun aggressive down hills. Nothing like passing a semi truck going 60 mph in a tucked position through a torrential down pour! Winding through the rural farmlands of Pennsylvania we got closer and closer to Annapolis. It was crazy to think how many experiences and emotions I had felt in those six days. It felt like an eternity, but overnight at the same time. As my last few efforts came to an end I tried to be mindful about the experience I had just undergone. The emotional highs and lows on the bike battling with my own mindset to push as hard as possible. The disagreements with teammates and crew that turned into laughing and a deeper sense of comradery. It is amazing how much can be packed into six days and three hours of racing. We arrived in Annapolis and secured our third place position. With several what if's throughout the way and scenarios that could've definitely ended our race, we were happy to have finished as well as we did. It was an incredible experience that not only tested my physical strings on the bike, but my mental and emotional capacity is as an athlete as well.